”We aren’t losing fans, we are fighting short attention spans. A fan’s viewing habits are changing, almost half of the 18-to 24-year old’s video viewing shifted from traditional TV to other platforms between 2012 and 2017 (2017, Nielsen Sports). In the disrupted media landscape, traditional TV remains the largest video consumption source overall. Nevertheless there’s a clear shift towards new platforms, mobile-driven video consumption and viewing behavior characterized by shorter attention spans. This forms a huge challenge for lots of industries, including the sports industry, to build and engage a fan base. As an answer to this trend, fan engagement is getting higher and higher up the agenda amongst media companies, sports clubs, federations, sponsors and more. Today’s popular content is interactive, socially engaging and easy to process. This explains the popularity of sports content on social media, on-demand media platforms and streaming. It also explains the rise of quick stats, votes, video highlights, daily fantasy games and more. People are looking for interactivity when engaging with brands, building social connections and self-expression. This does not only count for sports companies, we’ve seen some of the most successful companies such as Airbnb and Facebook build their business model around building social connections between people. In comes fan engagement. The high-level idea of fan engagement is to create social value for fans through a variety of online and offline experiences. These experiences fit within a larger engagement marketing strategy combined with the technologies to act upon. By doing so the goal is to optimize the ways you monetize your fan base. 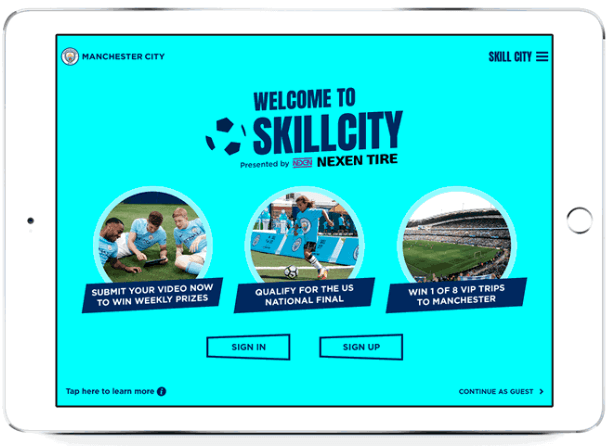 A good example is Manchester City, they interact with their fans in lots of different ways and one of their most creative campaigns to date is Skillcity: a youth skills challenge competing against friends, other players and City players. They built an app via which participants could submit videos and win 8 all-expenses-paid VIP trips. Next to building an app they involved lots of content, video, social media promotion and more. Nevertheless you don’t come across structured and continuous engagement marketing approaches such as Manchester City’s very often. Some of them launch one-of campaigns – executed by expensive marketing agencies – but this mostly defeats its purpose: engaging fans on the longer term. A lack of awareness or expertise, no budgets or an abundance of external offer often leads to decision-paralysis. This results in marketeers sticking to traditional marketing channels and products without looking into or incorporating fan engagement channels and technologies. Fan engagement should not be only be seen as ‘new ways to engage your fans’ but also as a way to gather valuable data about fans and their segmentation. This data enriches other marketing and fan engagement channels allowing more tailored communication with your fans and – not to forget – sponsorship. Experiment with fan engagement in an incremental way. Start with a fan engagement product such as a fan app or game, gather data, learn from this data and from there optimize your products and/or build new ones with this knowledge.